Green building isn't as difficult as you might think. RTKL's LEED Platinum 1225 Connecticut Avenue cost less and sold for more than most buildings. Copyright Paul Warchol. A couple of weeks ago, the Seattle Daily Journal of Commerce published an opinion piece titled, "Why green building has hit the wall, and what to do about it." The author, long-time green building advocate Jerry Yudelson, laments the relatively low rate of green building certification and asks, "Why hasn't the current system had more marketplace success?" The answer, he claims, is that the most popular rating system, the U.S. Green Building Council's Leadership in Energy and Environmental Design (LEED) program, is too complicated and costs too much. He points to his own organization's competitor system as "simpler, cheaper and more useful." As I wrote last Fall, Yudelson's program has been shown not to be all that "cheap" or "useful." However, he is right to point out that green building has not gotten as much traction as it should, given its many benefits. Recent reports show that LEED-certified buildings can cut greenhouse gas emissions and water consumption by half, while costing 25 percent less to operate and enjoying nearly 30 percent higher occupant satisfaction and lower interest rates. If green is so great, why does it account for only one percent of one percent of the total U.S. building stock, according to Yudelson? Recently, my team and I surveyed hundreds of architects and designers to understand the obstacles to going green. What emerged were six misperceptions about sustainable design. Conventional wisdom suggests that sustainability deals exclusively with environmental concerns. Wikipedia, for example, defines green building as "environmentally responsible and resource-efficient" structures, and I routinely hear from architects, "My clients aren't tree huggers." Yet, the original understanding of sustainability was that it integrates the "triple bottom line" of social, economic and environmental value -- people, profit and planet. My colleagues and I created the DART tool to guide designers toward achieving all three values at once. I can think of nothing that doesn't fall into one or more of those categories. Sustainability encompasses everything. "A Plan for a Sustainable Future" was the title of the cover story of the November, 2009, issue of Scientific American. The subtitle? "How to get all energy from wind, water, and solar power by 2030." This reflects narrow thinking: The problem is global warming, the cause is emissions from outmoded energy mechanisms and the solution is smarter mechanisms. Many architects seem to believe that sustainable design equals solar panels and wind turbines -- gizmo green. Technology has hijacked sustainability. "Is it progress if a cannibal uses a fork?" quipped the poet Stanisław Jerzy Lec. Often, smarter techniques merely make us better at making things worse. Sustainability is a choice of values, not a choice of tools. Perhaps the most common criticism about green building is that it's too expensive. In a 2008 survey of over 700 construction professionals, 80 percent cited "higher first costs" as the biggest obstacle to green building. Yet, even a dozen years ago the average surcharge for LEED projects was only two percent, and the additional investment typically yielded operational savings worth ten times that much, according to a widely cited report back then. By 2007, studies showed that LEED need not cost more at all. Now green building can actually cost less than conventional construction. By relying more on natural light and outdoor fresh air, the San Francisco Federal Building saved $11 million in mechanical cooling with a total construction cost of 13.5 percent below the market average. 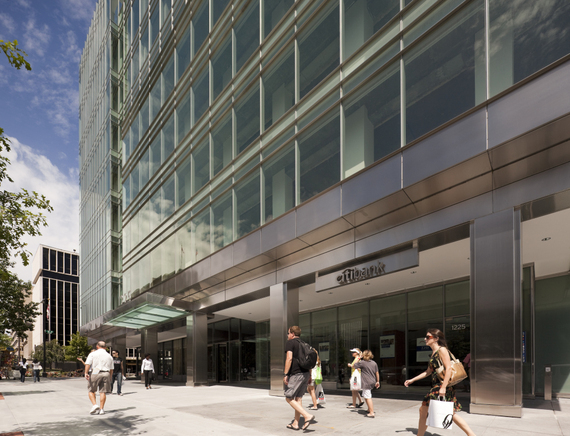 RTKL's LEED Platinum 1225 Connecticut Avenue, in Washington, D.C., cost about five percent below market rate construction in 2009 and sold for the highest rate in the city that year. Lower cost, higher return. Architects often complain that green building is too time-consuming. The additional research, analysis and hunt for alternative products simply cannot be done with limited schedules and fees. Yet, the process known as integrated design, which brings together a project's key stakeholders, designers, consultants and contractors early to get consensus on goals, actually can save time by ensuring more thorough coordination and avoiding costly changes later. When RTKL designed the Federal government's largest LEED Gold office building to date, the team completed the design nearly a year ahead of schedule, and construction finished four months more quickly than expected, saving millions in escalation costs. Sustainable design can lead to a better product faster. Some of the most celebrated architects dismiss sustainability because, in the words of National Design Award winner Peter Eisenman, it "has nothing to do with architecture." Performance specifications are hidden in the technical manual, not visible on the napkin sketch. Yet, basic decisions about a design's shape have a significant impact on both the resources needed and the people who use it. It's been estimated that 80-90 percent of the impact of a building or product is determined in the earliest stages of development: When just one percent of a project's up-front costs are spent, up to 70 percent of its life-cycle costs have been committed already. As the expression goes, "All the really important mistakes are made on the first day." "Some of the worst buildings I have seen are done by sustainable architects," Eisenman has grumbled. Famed architect Rafael Viñoly has said, "Sustainability has, or should have, no relationship to style." Designers care about image, and the green movement, like it or not, has a reputation for being all substance and no style -- ethics without aesthetics. Yet, as I argue in my book, The Shape of Green: Aesthetics, Ecology and Design (Island Press, 2012), the "look and feel" of design are essential to sustainability. If design doesn't appeal to the senses, it's destined to be discarded. "In the end," writes Senegalese poet Baba Dioum, "We conserve only what we love." We don't love something because it's non-toxic and biodegradable -- we love it because it moves the head and the heart. Following the lessons of sustainability to their logical conclusion will inspire more designers to reconsider the impact of every decision, including form and image. We can be as smart about the way things look as we're becoming about the way they work.